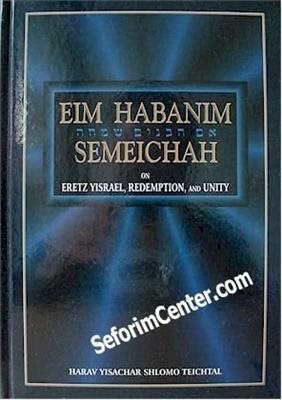 First published in 1943, Eim Habanim Semeichah remains the most comprehensive treatise on Eretz Yisrael, redemption, and Jewish unity. Much of this remarkable work has been proven prophetic by the passage of time. It is truly a priceless treasure. The saintly author, Rabbi Shlomo Teichtal, originally shared the prevalent, Orthodox view which discouraged the return to Zion. The Holocaust, however, profoundly changed his perspective. The annihilation of unprecedented numbers of his fellow Jews forced him to seek explanations. Thus, relying almost exclusively on his phenomenal memory and keen insight, he investigated the matter exhaustively. His conclusions are eye-opening! The Jewish people will find refuge from their troubles, he argues, only if they unite to rebuild the Land. This will bring about the ultimate redemption. Although more than fifty-five years have passed since its original publication, the message of this book is as crucial today as it was then. Born in Hungary in 1885, Rabbi Teichtal grew up in a family with an illustrious lineage. Many of his ancestors were great rabbis and Jewish leaders, and he perpetuated the family tradition. His father, Yitzchak, was a noted scholar, teacher and chassid. Yitzchak's father, Yissachar Shlomo (our author's namesake), served as a Rosh Yeshiva all his life and was one of the foremost chassidim of the Rebbe of the Rebbe of Tzanz. Translated by Rabbi Moshe Lichtman. Available in Hebrew too.